Good health is one of the building blocks for a good life. That is why United Way of the Greater Capital Region is committed to expanding access to health services. One way we accomplish this is through its partnership in the FamilyWize program which distributes discount prescription drug cards across the community. The discounts and savings are provided voluntarily by the more than 53,000 participating pharmacies that have agreed to accept this card. United Way works through its network of agencies and program providers across Albany, Columbia, Greene, Rensselaer, Saratoga, Schenectady and Schoharie counties to ensure the discount cards reach individuals and families who can benefit most from prescription savings. Together, with little effort, and no cost, we can reduce the cost of medicine by an average of 30% . If you are an employer, nonprofit or government agency, you are encouraged to distribute free FamilyWize cards to as many people as possible. United Way can provide you with as many cards as you can distribute. 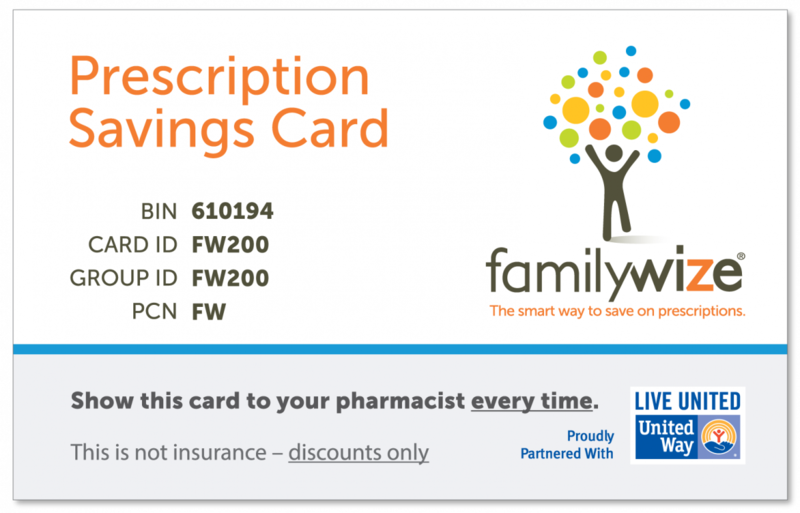 Take your prescription savings mobile and download the FREE FamilyWize App. Download a card for your wallet. See the list of participating pharmacies. Average Discount is 30% or more. Accepted at most pharmacies nationwide, including all major chains. Covers everyone with no health insurance or prescription coverage. All cards provide information in English and Spanish. No age, income or residency restrictions. Anyone can use it. No registration, activation, paperwork or enrollment. No cost to the United Way, your organization or people using the cards. The savings on the cost of the medicine is provided by the pharmacies. They have agreed to accept prices for medications that are close to the prices they make available to large insurance companies and employers. All other program costs are provided by in-kind donations from the program sponsors and by part of the processing fee included in the cost of the medicine. For more information, visit www.FamilyWize.org.